A plate full of pakoras is like a smile served on a plate; the ultimate comfort food whatever is the occasion. I have some Pakora tales to share from my childhood. While growing up, I remember, my parents had a close group of friends whom they socialised with often. In the UK, people usually go out for drinks and dinner but Indian parents preferred to entertain at home. They usually invited people over for high tea and pakoras were always served. I have visited many homes and I can honestly say I have never tasted the same pakoras at any home I have visited. Everyone seems to have their own recipe and each one tasted better than the first. We were dragged along to the frequent weekend soirees at family and friends homes and got to gorge on platefuls of sumptuous pakoras with a huge blob of ketchup and a mug full of sweet masala tea. These were the hangers on. They came to visit just as we were about to sit for dinner, they’d stay on and eat with us and never think of leaving. They’d plead with my parents and say ‘make sure you come over’ and reluctantly my parents would tag us along. They’d serve pakoras that were a poor comparison to the original. The gram flour would be in excess and if you were lucky you would find an odd lost onion slice or potato lurking around. The spices must have been on rationing too as they were very bland. To add insult to injury they’d give you the cheapest ketchup that they could possibly have bought and which was diluted too in some cases. My mum would give that look which meant eat that and you’ll die. The copy cats would always try to impress and try to go the extra mile. The copy cats would always dish out exactly what my parents had cooked for them. My mum’s friend would sit there making small talk and would get the recipe from my mum, and mentally noting down everything so she could copy and replicate it. My mum is an accomplished cook and spends a lot of time and effort perfecting her recipes so she was always very reluctant to share her recipes. When visiting the copy cats we’d get the replica pakoras they’d cooked. My mum would know straight away if they were replicated as she never gave away the full recipe. Now this is where I liked to visit. My parents had many posh nosh friends and this is where the competition stepped up a notch. If you popped over for a casual chit chat, they were always prepared with tea and pakora’s. We always had to accompany our parents, as we were too young to be left at home. We were served in the best china cups, saucers, masala tea would be poured daintily from a teapot and the range of condiments were mind boggling. As soon as we arrived we were served a pre-pakora drink, the favoured in the Indian household was always Lilt, the fizzy tropical drink and out would come the platter of nuts and Bombay mix. It’s a trick most Indians had mastered. Just as you’re about to say let’s leave, their children like well trained monkey’s word enter with copious trays of nibbles. There were always a choice of pakoras, with tandoori chicken, samosas, biscuits,mithai or Indian sweets, something left over in the kitchen, and many chutney’s and sauces. They always got my vote because they served Heinz ketchup so naturally they got a bonus point. My mum is a great cook and most weekends she’d spend cooking something new and amazing. She would always have some pakoras ready just in case the uninvited free food seeking trolls were to show up. You’d never catch my mum off guard, even if you turned up unannounced. We were trained monkeys too (yes I admit it), all I wanted to do was kill M Bison for the five millionth time on my SNES but I had to serve tea and pakoras to the annoying visitors with my sisters. If their visit was prearranged they got a platter full of goodies. We knew the drill, grab the plate, a handful of pakoras, a blob of ketchup and two types of chutney to accompany them. 80% of the time everything went flawlessly smooth and the other 20% of the time was the awkward ones. The 20% of the pakora hunters made you lose the will to live, the mission was to quickly feed these Neanderthals and get back to playing on Street fighter. They’d start by politely saying they’re not hungry, naturally you’d think they’re not hungry so you’d serve 1 or 2 pakoras with a tiny blob of chutney and ketchup. Like a well behaved child you’d pass them the plate and the look on their face would be like you’d murdered their first born with your bare hands. Once you grow up you slowly realise when people in your parents generation say they’re not hungry usually means they’re damn f@cking hungry but will not say it but my generation is straightforward- if you’re f@cking hungry just f@cking say it. The best part of the pakora weekend fest would be when all the family and friends would go home and I would butter slices of white bread and stack high with pakoras, a generous splash of Heniz ketchup, a glass of milk and lay back on the couch and play Street fighter 2 turbo until my fingers blistered from doing the hundred and slap. 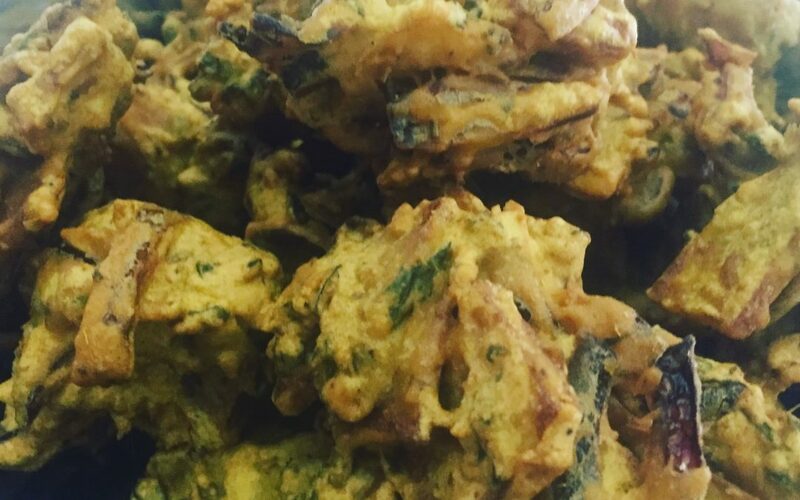 Below is a link to my pakora recipe.